Have you noticed that your dog is looking...well...a little rotund lately? A bit more curvaceous than usual? You're not alone! Approximately 17 million dogs in the United States are classified as overweight. But just because Fido has lots of company doesn't mean that he's in the clear. Extra weight is linked to a variety of health problems, including arthritis, diabetes, heart disease, and high blood pressure. You know your dog better than anyone - so you've likely already noticed if he has gained weight over a relatively short period. But extra bulk is a bit more difficult to recognize if he's been slowly packing on the pounds over the years. Here are two fail-safe ways to determine if Fido is at the correct weight. Run your hands along his sides toward the tail, feeling for his ribs. If you can find them beneath a thin layer of flesh, he is probably at the correct weight. If you can barely feel them under a layer of fat, he is likely overweight. A visual inspection of your dog's body is also important. Look at his body from above. Does he have an hourglass shape, with a slight narrowing behind the ribcage? Also view the lines of his body from the side. Does his stomach tuck up behind the ribcage? If the answer to both questions is yes, he's likely at the correct weight. If his body has no definition from above or from the side, he is probably overweight. Have a vet examine your dog just to make sure that he isn't experiencing a health problem. Some conditions, such as thyroid disease and Cushing's disease, can cause rapid weight gain. It's quite possible that you're feeding Fido too much at mealtimes. Often the serving size on commercial dog food labels advises a larger portion than is necessary for an individual dog. Every dog is different, and every dog also metabolizes food differently. With this in mind, start out with the recommended serving size but observe your dog carefully. If he looks like he's gaining weight, slowly cut back on how much you're feeding; if he appears to be losing weight, feed slightly more until he's at the recommended weight for his breed. Then simply maintain the portion size that works for your dog. Dogs who are "free-fed" - given access to their food bowls all day - are more likely to be overweight than those who eat on a regular schedule. To help keep Fido healthy, schedule his meals at consistent times and take his food bowl away after 10 to 15 minutes. Supplement correctly portioned meals with healthy, low-calorie treats, such as cut-up veggies, plain popcorn, or Nylabone Healthy Edibles. Make sure that you account for the calories in treats when feeding your dog his meals - these should be subtracted from his total caloric allowance for the day. Of course, any diet plan should be accompanied by the proper amount of exercise. Keep your dog active by making sure that he gets a few daily walks and multiple lively play periods - but work up to this gradually. An overweight dog won't be able to sustain this kind of energy level overnight. Continue to assess your dog's progress on a monthly basis to be sure that he's at a healthy weight, and maintain, maintain, maintain when he has reached his goal! A nutritious diet, meals fed on a regular schedule, and exercise will add years to his life. Excess weight in dogs, as in people, has been linked to heart disease, diabetes, pancreatitis, respiratory problems, orthopedic problems, and arthritis. In addition, those extra pounds cause a dog to overheat and tire more easily, which limits his ability to enjoy life. 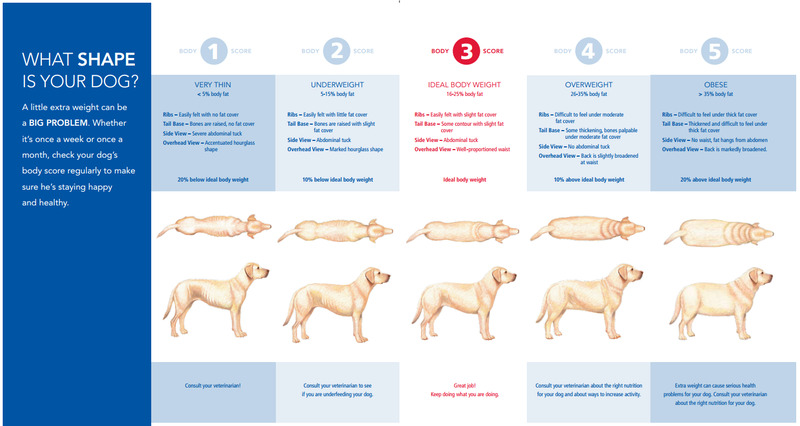 If you suspect that your dog may be overweight, it's time for a visual inspection. First, feel his rib cage. If you can't find his ribs, he's too heavy. Look at him from the side; his tummy should tuck up a little behind his rib cage. From the top, does he have a waistline, or does his body shape go straight back or even bulge out? If he has no waistline, it's time to help him lose weight! Start with a visit to your veterinarian. The vet may run a series of blood tests to check for low thyroid levels, which often causes weight gain. Once that is ruled out, the vet may suggest that you switch to a low-calorie, high-fiber food or even a prescription diet. If you just go cold turkey and reduce your dog's rations dramatically, his metabolism will decrease to compensate. Cut back gradually, over a period of days. Remember that treats and snacks add to the day's intake - feeding less food won't help if your dog also gets all sorts of other goodies. Set aside part of his daily food allowance to use as rewards - it's amazing how wonderful most dogs find a single piece of plain old dog food. Low-calorie goodies, like small bits of raw carrot or green bean, or sugar-free oat cereal, also work well. Use a standard measuring utensil to measure the amount you feed your dog. If you use a scoop or mug or something else to dish up the food, there's a good chance you are feeding him more than you think you are. Healthy meals do no good if your dog is scarfing down junk food all day long. Dogs are great beggars, and of course, fatty treats and table scraps also contribute to obesity. Treats should make up no more than 5 percent of his calorie intake. Switch to carrots, cooked sweet potatoes, or green beans as between-meal treats. If you use kibble for training or treats, subtract that amount from his meals. If your dog has eaten his allotment of calories and you really think he's still hungry, you can add bulk without calories. One way is to take a meal's worth of dry food, divide it in two, and soak one half in water for a half hour or so, letting it absorb water and expand. Then mix the dry portion into the soaked portion and serve. The swollen kibble will take up more room in your dog's stomach, making him feel as if he has eaten more food. Another trick is to mix high-fiber, low-calorie food into your dog's regular food-some foods that work well include unsalted green beans (uncooked fresh beans or frozen beans are fine; canned beans should be rinsed thoroughly to remove salt); lettuce or raw spinach; or canned pumpkin (not pie filling, just plain pumpkin). Just like people, diet and exercise help an obese dog lose weight. If your pup is not exercising every day, it's time to go for walks and play fetch. Start slowly if he's uncomfortable or gets tired easily, and work up to several sessions of activity every day. Dogs 101 Labrador Retriever 2011 TFH Publications, Inc.
Food makes most dogs happy, and making your dog happy makes you happy. So why not show him how much you love him by feeding him what he wants? Who cares if he's a bit pudgy as long as he's happy? Unfortunately, those extra pounds can lead to serious problems in dogs, as it does in people. Being overweight will make daily doggy life more difficult. Your dog won't be able to run as fast or jump as high without hurting himself, he'll overheat more easily, and he'll tire out more quickly. He won't even be able to curl up into a nice little doggy ball for a fireside nap. Extra weight can also contribute to serious health problems and shorten your dog's life. Fortunately, if your pup gets too much padding, you can do a number of things to help him take it off. Start this year off on the right paw by following these tips to help keep your dog in tip-top shape! If you aren't sure whether your dog is obese, check him out. You should be able to feel (but not see) his ribs. From the side, you should note a tucked-up abdomen; from the front, you should observe a definite waist. Otherwise, he may be overweight. For the most accurate results, use a scale. If your dog weighs 15 percent or more over his ideal weight, he is clinically obese. Should your dog qualify as overweight or obese, start out by consulting your veterinarian. Your dog's extra weight may stem from a medical problem such as hypothyroidism or Cushing's disease. Even psychological problems like stress can cause obesity. These and similar problems need to be ruled out before you help your dog shed pounds. One way to go about getting your dog to lose weight is to cut down on his calories by reducing the amount he eats. Many people simply feed portions that are too big. It's easy to get into the habit of scooping "one serving" without realizing your scoop may be oversize and is actually closer to two. To prevent this from happening, measure your dog's meals using a standard measuring device. In some ways, this is preferable because it doesn't force dogs to change from eating the foods they love. Of course, lowering calorie intake does not mean a crash diet. First, crash diets don't work - your dog will tend to regain weight when the diet ends. Second, these extreme diets put tremendous psychological stress on your dog. He has no idea why you are suddenly starving him. And third, crash diets are potentially dangerous because they often lack important nutrients in sufficient amounts, especially with non-premium brands of dog food. So do not simply cut back on your dog's meal portions without good research about how much food he needs. While the actual number of calories a dog requires to maintain weight is variable from individual to individual (just like people), a few general rules apply. Large dogs, neutered dogs, and older dogs burn fewer calories pound for pound than their smaller, unneutered, younger cousins. Also, dogs burn more calories in the winter. Check with reputable sources, such as your local veterinarian, to decide on an appropriate new scoop measurement. Another way to help your dog lose weight is to put him on a special weight-reduction diet. These special diets are usually low-fat, high-fiber diets that can promote weight loss better than simply feeding smaller amounts of high-fat foods. Fat contains about twice as many calories as proteins or carbohydrates; good diet foods usually have a fat content of 5 to 12 percent (dry matter basis), along with at least 25 percent protein and an adequate level of vitamins, minerals, and fatty acids in the form of fish oil. And the secret ingredient? Increased fiber (7 to 30 percent). Fiber stimulates chewing, slows the movement of food from the stomach (making the dog feel full), and stabilizes the blood glucose level to reduce that hungry feeling. One caution, though. The directions, even on a diet food, may instruct you to give enough food to maintain your dog's present weight. It's a legal thing - otherwise, the food can't be advertised as being sufficient to keep the dog alive by regular feeding. Diet foods should have another panel that tells you how much to feed to help your dog lose weight. Those are the directions you need to follow. There are many excellent prescription weight-loss diets on the market, and there are also some non-prescription brands that are formulated for this purpose. To make the weight-loss process easier on your dog, feed him two or even three small meals each day rather than one large meal. This might reduce begging as well. Or you can measure out the food allotment for the day, then give half for breakfast with the rest doled out throughout the day in place of treats. But to do this right, you need to accurately measure out the amount. The holidays can bring all members of your family - even the four-footed ones'together in a wonderful way. By following some simple safety precautions, you can be a holiday hero for your dog! Extra weight can sneak up on dogs just like it does on people. An indulgent treat here and there or an especially well-rounded scoop of kibble rarely causes a problem, but making either move a habit can add several pounds to your dog's weight over time, often before you even realize it. When they gain weight, dogs sustain a higher risk of suffering from multiple health problems - including arthritis, orthopedic injuries, even heart issues. A few extra pounds may seem like nothing to a person, but for a dog, this seemingly insignificant weight gain can take weeks or even months to lose. A better approach is preventing obesity altogether. The simplest way to keep your pet's weight in check is by feeding him dog food, but whether you buy prepackaged food or prepare his diet yourself, sticking to your plan is essential. Your veterinarian can help you determine the best number of calories for your pet based on his age, breed, and size. Feeding a healthy food is only the first step, though. You also must offer the proper amount of food at each feeding. A dog can gain weight by eating too much of any food - even low-calorie formulas intended for weight loss. Treating your canine companion to healthy human foods like raw carrots or lean meats can also be part of his routine, but be sure to adjust the portions of his regular food so that these treats don't cause a problem. Avoid high-calorie or nutritionally deficient human snacks, too. Even in moderation, feeding these junk foods can make some dogs turn their noses up to carrots the next day. Skipping them completely means you will never have to break the habit with your pet. And of course, make sure that everything your dog eats is safe for dogs. Beyond well-known dangers like chocolate, seemingly innocuous foods like grapes, garlic, and onions (along with common ingredients like the sweetener xylitol) can also harm canines. You should certainly factor your pet's activity level into his diet plan, but remember that even active animals have calorie limits. If your dog participates in an organized activity such as agility, for example, a food higher in fat will give him the energy he needs. If you feed too much of it and he doesn't burn off the additional fat, however, it will cause him to gain weight. Eating right is only part of the equation for keeping your dog's weight within a healthy range. Regular exercise is also essential. Getting outdoors and breathing fresh air is good for your pet both physically and mentally. Just the change of scenery can turn an otherwise boring day into a fun field trip. And making a routine of getting your dog on his feet and moving around creates momentum. After just a few days, you may find that your dog even initiates the activity. Daily exercise serves a dual purpose for keeping your dog at a healthy weight. First, it provides a way for your pet to burn calories. 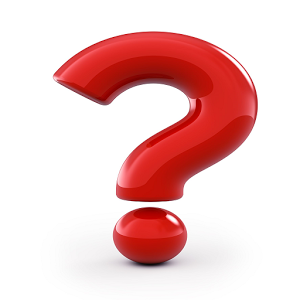 How many depends on the length and intensity of the activity. (Where you exercise can also make a difference. A walk or run with multiple hills, for instance, provides a better workout than one on level ground.) Second, sticking to an exercise routine can help increase your pet's metabolism, the rate at which your dog burns calories. Even the number of calories he burns when resting will increase as a result. More intense exercise, like running after a ball, causes a dog's brain to release endorphins. Dog and humans are quite similar in this way. As hard as it can be for some of us to take that first step, think of how great we feel after we exercise. Dogs receive this same benefit from being active. Remember to watch your pet's signals, however. Dogs can overheat easily, which can cause serious health problems, so build your exercise routine slowly and take frequent water breaks during outings. Stop exercising whenever your dog shows signs of fatigue. Food has been shown to be a highly effective motivator for dogs in training, but you don't have to sabotage your pet's health in order to teach him commands or tricks. Instead of feeding him high-calorie snacks during training, use your dog's regular food instead. If you are attending an evening training class, pour his regular kibble serving into your treat pouch before heading out the door. Your dog will happily work to earn this reward without consuming any extra calories. Bear in mind that food isn't the only means of rewarding a dog for a job well done. A heartfelt "Good boy!" will please your pet more than you might realize. Most dogs truly enjoy making their owners happy. Effusive praise goes a long way in both training your pet and making him feel loved and appreciated. Sometimes we all just want to spoil our pets. At these times, it can be easy to convince ourselves that just a few slices of pepperoni from a slice of pizza won't hurt a dog-right? The good news is that we can give our animals a tasty treat like this without upping those numbers on the scale. You can indulge your dog's urge to snack with Flavor Frenzy Chew Toys, which come in delicious flavors like meat supreme pizza, Philly cheesesteak, and birthday cake. Whereas edible rewards must be doled out judiciously, your dog can chew on these zero-calorie treats as often as he likes.